Are We There Yet?? : I've Got Mail! It will never cease to delight me to get an email from out of the blue from a reader of my blog. (Well, it might if that person is writing to tell me that my blog stinks and I have no business trying to write or take pictures but I've got my fingers crossed that won't happen!) Last week I got not one but two emails from readers who had apparently stumbled upon my blog via web searches. The first email came from Wayne who wrote to me regarding a post that I had written last June about my then-recent trip to Santa Cruz to visit blogging buddy Katherine and take in some of the California seacoast. 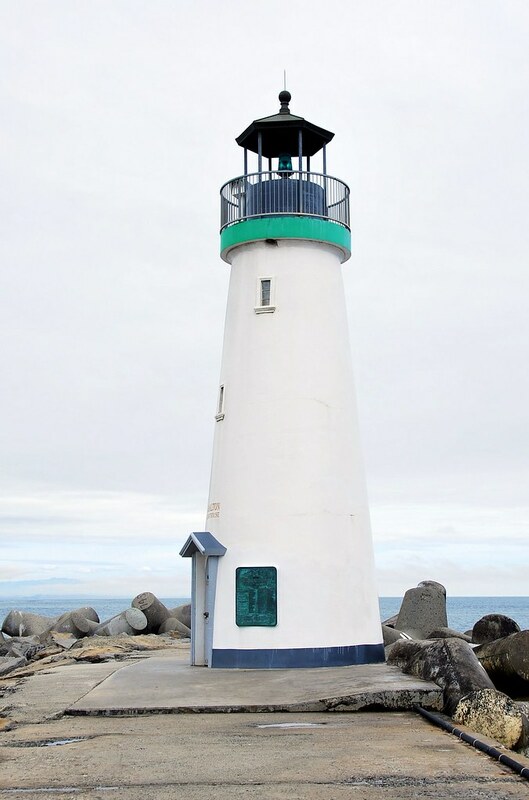 In my post, Santa Cruz - Day Two I had made mention that I was curious about the odd-shaped cement breakers that surrounded the Walton Lighthouse as they all seemed to be numbered and yet placed helter-skelter on the breakwater. An anonymous commenter on that post had left me the information that "The pieces are numbered to assist the engineers in how they wear in the pounding of the surf and if they fail what was the composition and date and shift they were formed". That sounded like a great explanation to me as previously neither I nor Katherine knew why they were numbered like they were and I'd had no luck with an internet search I'd done while trying to find the answer. 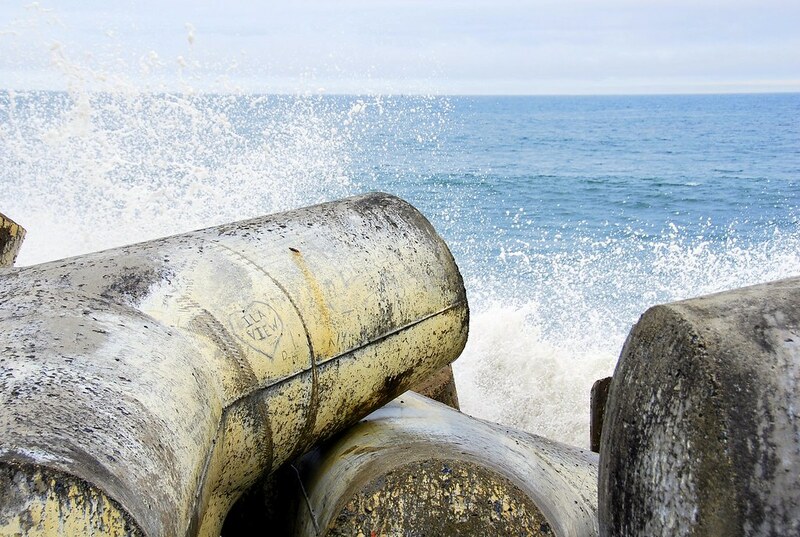 "I saw your article about the Santa Cruz Harbor and you were curious about the “odd-shaped cement breakers”. I found this article about how and when they were built and wanted to share it with you. This file is over 18Mb so it could take a while to download, but it is worth it. You can click on the link, “Building the Santa Cruz Harbor by George N. Wagner, Branch Manager (retired), Granite Construction Company” located at this web site, http://www.santacruzharbor.org/education/." Wayne was right, it did take awhile for it download but the article explained not just about the tetrapods - the official name of those odd-shaped cement pieces - but also just how the Santa Cruz Harbor was constructed. The article was written by Mr. Wagner in response to questions from his grandson, Abe, who asked, "Grandpa, how was this harbor built? Where did the stone come from? Where did the jacks (tetrapods) come from? Did you build them?" In order to answer those questions, Mr. Wagner wrote a 152-page article - complete with pictures - detailing the building of the Santa Cruz Harbor and even though it's pretty technical in places, it's a very interesting read. Turns out that there are a total of 900 tetrapods, each weighing 28 tons, that were constructed at the rate of 40 a week. In addition to the time it took to pour the giant cement jacks and for them to set, it then took another 24 to 25 days for the cement to cure before the tetrapods could be placed around the jetty. It took 2-1/2 months to properly place them all and even though they look like they've been laid out pell-mell they were carefully placed to keep the ocean waves at bay. To us it may look like a giant child just got tired of playing with her jacks and tossed them down near the edge of the water but there's definitely a reason for them being the way they are. 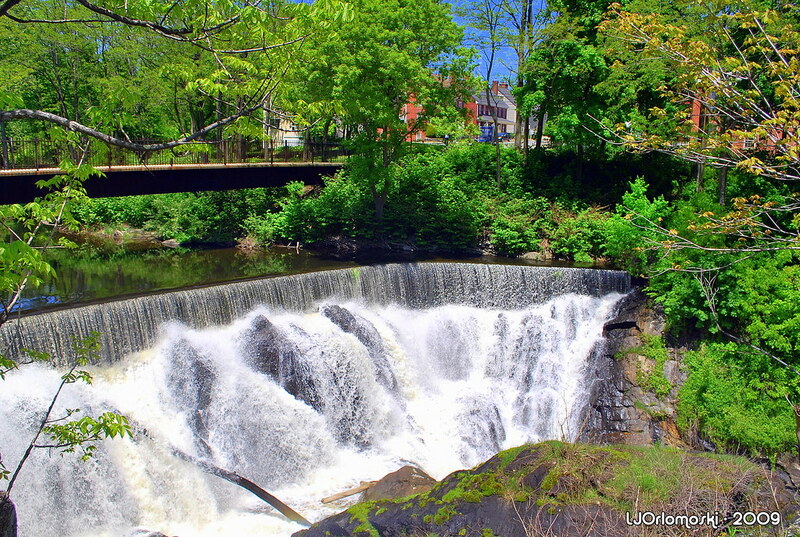 "I've often visited Yantic Falls throughout the past 30 odd years. I understood a "Leaping" legend existed, but never quite got beyond my slack-jawed trance upon each visit following a particularly significant rainfall. Wishing to get the legend straight in my mind, I happened upon your blog. WOW! What a beautiful webpage! The images of the Falls are magnificent. Now I've got a link to send to my son away at college in VT. 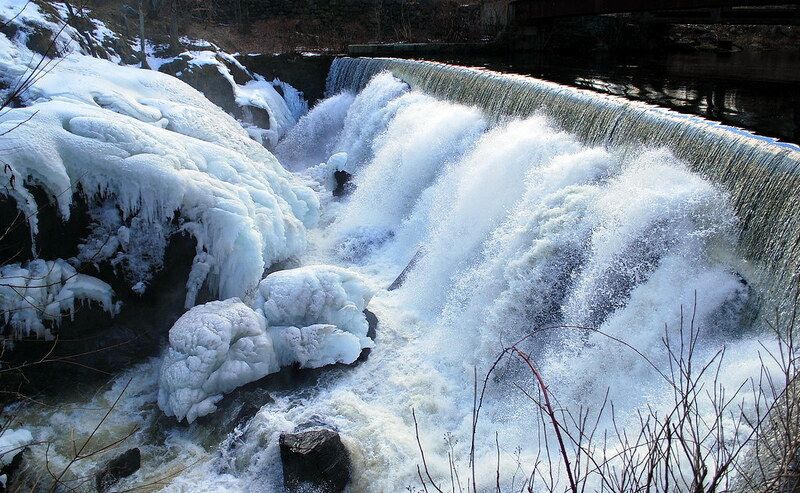 He & I visited the Falls over his holiday break this month and were blown away yet again by the sheer force of the water, and majestic ice formations on the adjacent cliff. Thanks again for fleshing out this legend for me." I'm going to guess that Bob was referring to my post The Legend of Chief Uncas and Indian Leap that I wrote in December of 2008 though I have written about and posted many pictures of the Indian Leap Falls area. If you had something that looked like this practically in your backyard, I bet you'd go there a lot, too! I like Bob's term of "majestic ice formations" so much better than mine of "very large pieces of frozen cauliflower" when it comes to describing the area around the falls in its winter splendor, don't you? Thank you, Bob, for taking the time to send me an email and I am beyond delighted that I was able to tell you the story of Chief Uncas of the Mohegans and his leap across the chasm in his pursuit of rival Chief Miantonomo of the Narragansetts. As someone who often finds herself wishing she had chosen to teach history rather than dispatch ambulances for a living, it means a lot to me to know that I told a story that someone wanted to learn. I guess in some small way it sort of makes me a history teacher after all! Well deserved praise of your postings Linda! And awesome photography! When I get emails from people that found my blog, it is usually about helping them share my paypal account lol. Happy New Year, I did not have a chance to tell you that yet. Wow, I didn't know what they were either. How cool to get an email explaining what they are. Way cool. That would have made me feel good too. Hi Roger...great to see you out and about. Yowzers-900 of those suckers!?!? That's crazy!! It's very cool when readers come out of the blue and comment or email. I always get a kick out of it too. Cyberspace makes the world so much smaller and friendlier, doesn't it? very cool, i have only had things like that happen once or twice but sarge has and it's great! Can I comment on two posts at once? First I just wanted to say that when you get to be on Jeopardy or "Who wants to be a" let us know, I want to watch. Seriously though, I always enjoy reading your posts and I frequently learn something. Me, I'd love to teach English Lit, but hope eventually to teach Nursing instead. I am glad you are getting good feedback. Warm fuzzies are great. How good to get a fan letter! Since I'm new to your blog I enjoy the links back to old posts. It's also fun to read about the area I grew up in. My Dad told me this story, but it's nice to re read and remember. It's a reminder to pass it on to my kids. Oh yes, I can well imagine how absolutely thrilled you were to receive those two emails! Really makes you realize that through your blog and photography, you can teach so much about the areas around you and wherever you visit. How cool you are! I am loving your photos. You may have a new career path there. See, you have quite a following, my dear. Very well deserved! I loved that frozen photo. YES! you are a history teacher, Duchess Linda of Norwich-Upon-Thames. The large pieces of frozen cauliflower description is accurate and fun to imagine. The blogosphere is truly a friendly place. Playing catch-up here on Friday morning. very nice! I love getting comments from new people! gonna go read the article. I'm gonna tell all kinds of people. you'll have to come back soon....have lunch with wayne.